Toronto – Last Friday evening Mz. Chawles and The Wonderfuls played some sweet soul music at Czehoski’s to a densely packed crowd. 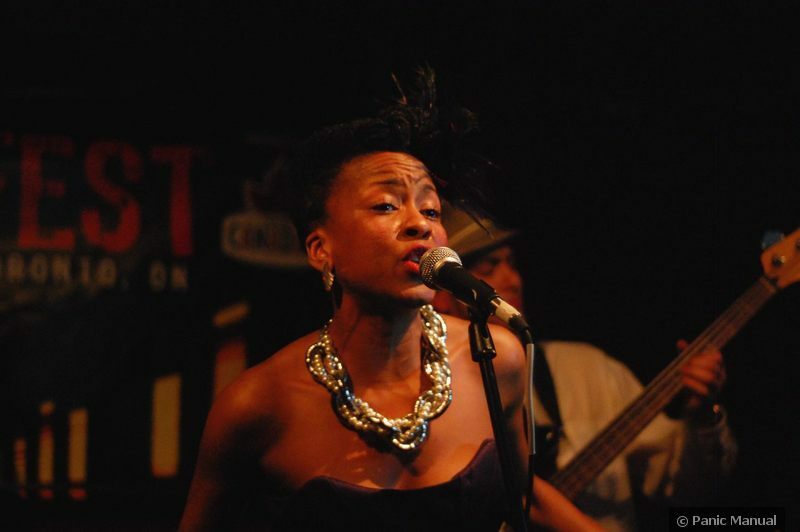 The band is fronted by Tanika Charles, a Toronto-born but Edmonton-raised singer that has returned to the city to ply her trade. Toronto is happy with her return to the city; she brings with her both a considerable stage presence and an impressive voice. This was my first time at Czehoski’s for live music, and it makes for an interesting venue. It’s a long and narrow room with the stage at the very back. Both sides of the aisle are straddled by tables for the restaurant folk, making the live music more of a side entree rather than the main course. This however, was Canadian Music Week, so it was all about the music and the drink. The upshot with such a tiny hall is that just a few dozen people can make the place feel cozy. The Panic Manual is by and large a huge fan of soul revivalists. Although I just made that last sentence up, I can tell you this: I am a huge fan of soul revivalists. There was a lot of charisma and musicianship emanating from Ms. Charles. As superbly fun as this show was, I can’t help but wonder what a few extra years experience will do to Ms. Charles’ diva persona. There certainly seemed to be times when she was channelling soul queen Sharon Jones. I can’t wait to see what Ms. Charles will be like with a few more years worth of gravitas. I don’t think the Pips would ever dare do this to Gladys Knight. As a matter of fact, I’m confident that every single Pip knew exactly which side of their bread was buttered. If there was one minor slight about the set, it had nothing to do with Ms. Charles herself, but the backing band. As the set drew to a close with a candid song about money, they decided to surprise the singer by abruptly launching into Pink Floyd’s Money. It was apparent that Tanika had no clue about the pre-meditated prank. She was surprised, but made a valiant attempt to keep composure. She asked the crowd if they knew the lyrics and encouraged a sing-along. This was a jarring loss of momentum and an underwhelming way to end what was otherwise a fantastic set of music. Any group with name that follows the format of “Bandleader and the Backups” is largely being powered by the sheer force, charisma, and presence of the lead singer. I don’t think the Pips would ever dare do this to Gladys Knight. As a matter of fact, I’m confident that every single Pip knew exactly which side of their bread was buttered. Surprising Tanika with a prank like that broke the magic spell that she had the audience firmly under. It demonstrated poor judgement. Sadly, the Wonderfuls were anything but, with the notable exception of soul sister twins Keisha and Leisha Cameron on backing vocals. The good news is that as a starlet like Ms. Charles grows, she will be able to command the attention of the best, brightest, and most dedicated of backing bands. The afore mentioned Sharon Jones did it with the Dap-Kings and their talented bassist and band-leader Bosco Mann. I can see Ms. Charles doing the same in due time. Then things will really get wonderful. Toronto – You know I really like Bread & Circus. It’s a super laid back place in the heart of Kensington Market and it easily lends itself to intimate musical experiences. It’s been a full year since I’ve last frequented the joint, but I am now going to make an effort to get back there over the summer. While the drink selection isn’t huge, the prices are reasonable, and the staff is friendly. 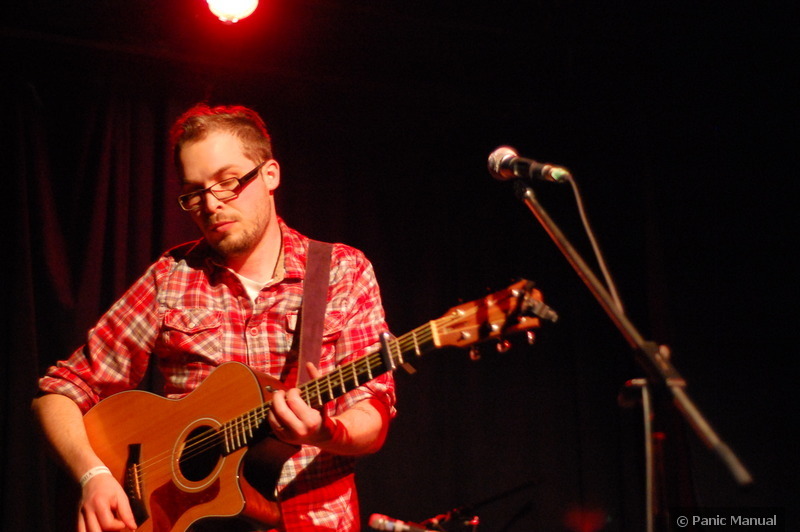 Thursday evening began at the Circus with Steph Macpherson, a singer-songwriter based out of Vancouver. It was a foot-tapping experience. She played well-constructed folk rock. Everything seemed like it was in the right place. It was tastefully done. I believe I was bobbing my head and tapping my foot in the all the right places. While Steph has a very sweet voice, I wonder what a few extra years of experience on the road combined with a bit of risk-taking might do? I’d be curious to hear the result. 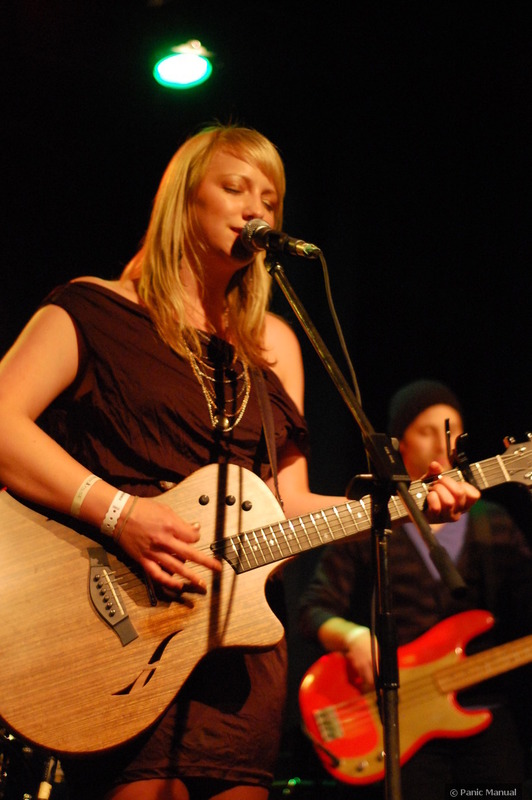 Steph Macpherson plays the Central, March 12, at midnight. Next up was The R.G. Morrison. The first thing I noticed about R.G. Morrison was that he had a pronounced U.K. accent; he was decidedly not Canadian. As an aside, this year’s Canadian Music Week line-up seems to have the highest selection of non-Canadian music I’ve seen to date. I’m not sure if this is actual fact, but I expect CMW to focus mostly on Canadian talent, leaving the world-wide stuff to NXNE. Perhaps, there has been a conscious change in artistic direction of the festival? I will try and find this out and report back. The second thing I noticed is that, while “The R.G. Morrison” sounds like a band name, and is in fact a full band, only front-man R.G. Morrison himself was on stage. He explained to us that his band had been caught up in American customs. Without getting into details, he explained that this show was going to be a solo one, and it would give him a chance to play some solo material that he doesn’t usually play live. The third thing I noticed is that R.G. has a powerful and emotional voice. Once he got into the groove of the set, I was pulled into his music. It can be amazing what one talented musician can do with just a guitar and a voice. His guitar work was just a touch more complex that the standard singer-songwriter fare, making it a perfect accompaniment to his both nuanced and impressive set of pipes. This was an intimate musical affair and live music at its best. I can’t pretend to know what the actual band would have sounded like, but I was happy enough seeing R.G. Morrison play an intimate solo act. It was a nice little slice of CMW.